Brazil take on Argentina in Belo Horizonte on Thursday night, with both teams in very different shape. Having swept to Olympic gold in August, the Seleção have won all four of their qualifiers since new manager Tite took the reins. But while Brazil sit at the top of the CONMEBOL standings, Argentina currently sit in 6th place, outside of the playoff spot. Albiceleste’s new boss Edgardo Bauza has not enjoyed a comparable start to Tite. Argentina is enjoying a generation of bright coaches, with the likes of Mauricio Pochettino, Diego Simeone and Jorge Sampaoli raising plenty of eyebrows. The problem is, none of them want to manage the national side, with the AFA in turmoil. Even the notoriously madcap Marcelo Bielsa turned down the chance to coach Argentina. Argentina have one of, if not the most talented national side in world football. The likes of Lionel Messi, Sergio Aguero, Gonzalo Higuain, Angel di Maria and Javier Mascherano are amongst the most recognisable names in world football. However, successive managers have struggled to make the Albiceleste attack into a unit. The likes of Aguero, Higuain and di Maria are used to being the main men at their clubs, but all must hide their lights under Messi’s bushel. Tite inherited an equal, yet opposite problem when he accepted the Brazil job. But rather than having too many star players in his forward line, he only had Neymar. Previous boss Dunga had allowed Neymar to move from becoming the focal point of the team, to assuming the mantle of a one man unit. He was afforded a free role, which often meant that he was drawn towards the ball in deep areas, whereupon he would try to mount attacks on his lonesome. Dunga had also, bafflingly, made the Barcelona forward his captain, ostracising Thiago Silva in the process by stripping him of the armband. It had become clear that the armband had swollen his ego. Tite immediately faced a tough, but crucial, political undertaking. Taking the captaincy off of Neymar without unduly upsetting his star turn. Tite’s solution was to rotate the captaincy game to game, an initiative he deployed at Corinthians to promote shared leadership. Having captained Brazil to Olympic gold on home soil, Neymar was happy to surrender the armband. "Today I have been proclaimed a champion and I hand over the armband as captain," he said in the aftermath of the Olympic final. Tite handled a potential hot potato with aplomb, though the coach admits that the player still has to work on his petulant streak. Tite has however reduced Neymar’s tactical role to something more manageable, giving him the same roaming left sided role that he enjoys so much at Barcelona. This is partly where Tite has been very fortunate. For years, Brazil has lacked a top class number 9. Mano Menezes, Felipe Scolari and Dunga all had to make do and mend in this crucial position. Players were either shoehorned into a false 9 role (Tardelli, Robinho, Firmino), or else strikers that were not quite international vintage (Fred, Jô, Jonas) were tolerated. Tite has arrived at the right time to fully realise the talent of 19 year old Gabriel Jesús. Jesús plays principally as the team’s number 9, but having started his career as a left winger, he has formed an effective partnership with Neymar, with the two swapping positions at will. Jesús has four goals in his first four full international matches. 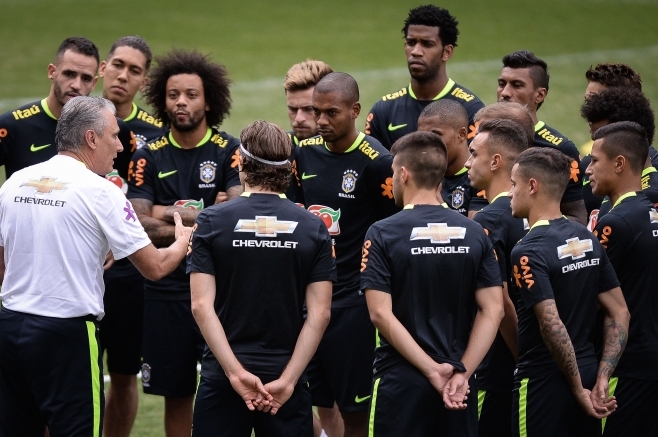 The time spent with the Olympic squad preparing for the 2016 games proved to be the perfect incubation period and Tite has arrived at an opportune time to benefit from his ripened talent. Olympic gold, along with the removal of the unpopular Dunga, has lifted some of the gloom around the Brazilian national side. On the contrary, Argentina are in something of a funk. Their FA is enveloped in crisis (not that the CBF is a smooth ship by any means), so when Tato Martino resigned, a host of bright Argentine coaches turned the job down. Current coach Edgardo Bauza was well down the list of candidates. Whereas Tite has been able to harness ‘Neymar-dependência’ to this point, Bauza has struggled to reduce Argentina’s dependence on Lionel Messi. The Barca genius hinted at the discord around the national side by retiring from international football following their 2016 Copa América final defeat to Chile, before retracting. His lack of fitness has coincided with some poor results that have left Argentina floundering in their qualifying campaign. They have won all three of the qualifiers that he has started, but have only prospered in one of the seven qualifiers that he has been unavailable for. The bad feeling around the team is undoubtedly precipitated by consecutive defeats in the 2014 World Cup Final, the 2015 Copa América and the 2016 Copa América Centenário- the latter two on penalties to Chile. Such fortune would be enough to test the sunniness of anyone’s disposition. However, on Thursday evening, Brazil’s breezy optimism will be tested as they eyeball a ghost from their recent past. They will play at the Estádio Mineirão for the first time since Germany’s 7-1 humiliation of 2014’s World Cup hosts on their own patch. The scars of the ‘sete um’ still run deep. Brazil have typically been holding their home World Cup qualifiers in the north of the country, with sellout crowds in territories such as Natal, Recife, Salvador and Manaus. 9,000 tickets remain unsold for Thursday’s game, which suggests the attitude towards the Seleção remains cooler in more southern parts of the country. Argentina will have Messi, who appears to have just hit his stride for the season with a man of the match display against Sevilla. Neymar meanwhile, has 1 assist, 0 goals and 4 yellow cards in his last four games, suggesting that his Barca teammate is better placed to elevate his team to victory. Brazil and Argentina are trains that have been travelling in opposite directions for much of the last few months, but there is no guarantee that those trajectories will be observed when the teams clash on Thursday. Superclasicos are often cagey, sometimes very physical affairs. Generally they are high on intensity and low on fluency. Brazil are functioning better as a collective, but Gabriel Jesús has shown signs of fatigue with Palmeiras, having not scored for nearly two months now. Neymar is in uninspiring form, but Messi is available and seems to finally be coming to the boil for the season. It’s fascinatingly poised to be an absorbing contest.